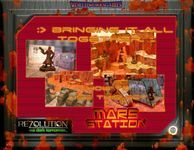 Mars Station is a spectacular new terrain and building set from WorldWorks Games. It's fully compatible with the hot new Science Fiction game, Rezolution, as well as all 1" Sci-Fi RPG games. On the tortured, ancient, windswept surface of Mars in 2175, danger lurks. Explore modular buildings that come with fully detailed interiors and props to make a variety of structures: Workroom, Communication room, Laboratory, or Tavern. There are twenty unique walls, with various combinations of window and doors. Add doors, clear windows and even a second story, then dress it all up with unique Street Tech props. Grab some cover behind fences and barricades in the industrial zone. The action can move from the dusty streets to the rocky canyons of the red planet. Explore the mystery and danger of the Martian desert with our revolutionary modular Canyon construction system. Build them any height from 6 inches high to just half an inch. Stack them up and add steps and a bridge! This modular Canyon building system is super easy to build and endlessly customizable. * 15 ground tiles - Mars terrain, industrial, floors and roofs. 1" Grid and No Grid options. * 20 modular building walls, interior and exterior, flat or angled roofs, railings. * Street props. Lamp/signpost, concrete barriers, stairs and catwalk. * Industrial props. Fences, five machines, horizontal and vertical storage tanks with base. * Our Revolutionary Canyon building system (well worth the price of the set all on its own! ).